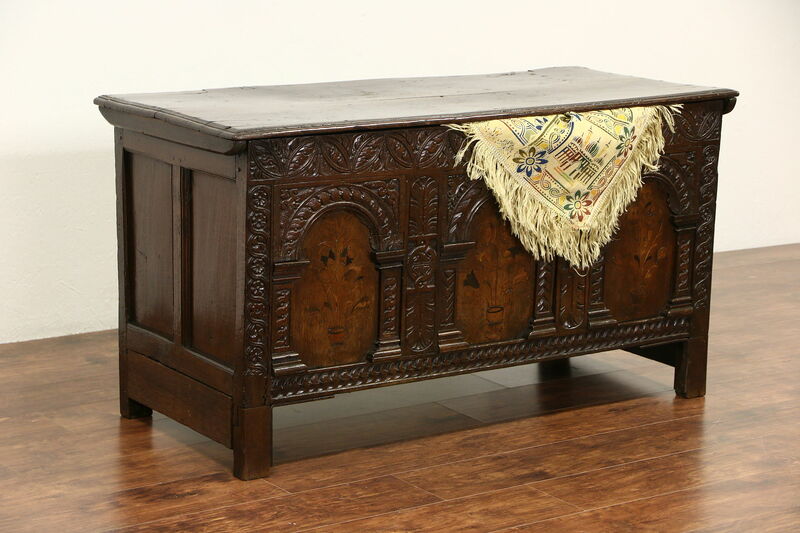 Hand carved of solid oak around 1700, a wonderful French trunk or dowry chest has inlaid marquetry panels. Hand hewn with carved pegs at the joints, there have been various restorations over the centuries, including the feet as would be expected. The restored finish is in excellent condition, preserving losses, mars and stains for antique character. Inside is a small compartment for valuables. Arched panels have still life scenes, with artistic inlay of ebony and fruitwood. Lavish deep carving incorporates traditional motifs. The lock is missing. This historic European furniture would have descended with the daughter of a wealthy family, holding her silver and linens as part of her dowry. Measurements are 55" long, 23" deep and 29" tall. See 28 photos on Harp Gallery website that enlarge to full screen size.